I like seeing things from my childhood make a comeback. From toys to TV shows, it’s fun to watch my kids get excited about things that I loved as a child. One of those greats from my younger days is the classic cartoon, Tom & Jerry. I remember watching the cartoon growing up and enjoying the cat-and-mouse fun. My sons have been exposed to it on the classic cartoon channel we have and my oldest in particular loves the dynamic of Tom & Jerry. Created by the famous duo of William Hanna and Joseph Barbera, Tom and Jerry showcases the classic cat and mouse rivalry of Tom the cat and Jerry the mouse. The original series won the Academy Award for Best Short Subject: Cartoon seven times! I think most of us can remember watching this series as children, and it’s great to see another generation getting joy out of the classics. 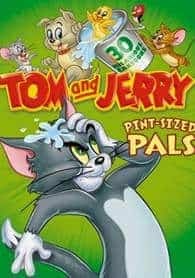 I received Tom and Jerry: Pint Sized Pals for review. This is a 2-disc set that has over three and a half hours of classic Tom and Jerry as well as a number of contemporary episodes. My kids got a kick out the shorts – especially my older son who loves the slapstick comedy of all the T and J pals. The episodes feature Tom and Jerry with some of their more notable pals – Nibbles the mouse, Quaker the duckling, and one of my favorites, Spike the bulldog. I enjoyed watching these shorts with my kids and am definitely putting these discs in our cartoon rotation! To learn more about Tom and Jerry: Pint Sized Pals, visit the official Facebook page. You can also watch full episodes on their website. This DVD was released on March 5th and sells for just under $14.00 on Amazon. I love the classics and the antics of Tom & Jerry. This was my absolute favorite cartoon as a child. It’s great when tv shows make a come back. The parents and children can sit together and both enjoy them! My son loved Tom and Jerry growing up…a must afterschool treat. Now, he can share it with his two kids. He isn’t much for animated shows but certain ones he will watch, too. I’m looking forward to getting this for them. I’ve gotten them some of the shorter dvds before but love that this one is a good length with classic and contemporary. Haha wow, they’re bringing back all the great shows. Thanks for sharing this, I’ll have to look it up. Hope it compares to the original! I watched these cartons, my sons watched them and I am sure my grandchildren will enjoy their sntics as well.